Types of vacuum cleaners should meet job types. For example, if you want to clean your carpet, then upright vacuum cleaner will do the job. 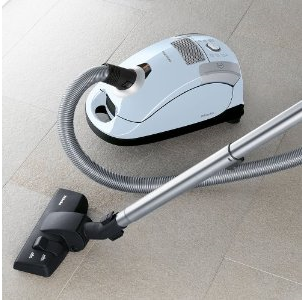 If you only want to clean bare floor, a canister type vacuum is recommended. Or you can choose upright vacuum cleaner and purchase its accessory/attachment for cleaning bare floor. The majority of our house is covered by carpet, so upright vacuum was the one we initially chose. However, we have stairs and we do not want to lift it up and move down the stairs, so we decide to go for canister type vacuum cleaner. 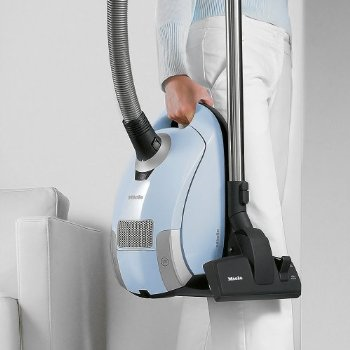 This Miele S4212 Vacuum cleaner is an canister one and the good thing about this vacuum is that Miele is designed for short-pile carpet, area rugs and hard surface floors. It does the job and provides mobility. Maybe weight is not a concern for lots of people, but we do! I do not feel like taking a humongous monster and cleaning my house, especially we have stairs! In addition, if I choose a heavy and powerful one, then my wife is not going to use it forever. In order to reduce my work (thank you Miele), we explore numerous vacuum cleaners and this one only weights 14 pounds! Our previous dyson is at least five pounds more. With Miele S4212 Vacuum cleaner , cleaning the stairs and pulling it around as you clean is never a problem. Miele also provides great mobility while it is well balanced and stable. Suction power is another thing you should consider. Normally, canister vacuum cleaners have less power as limited by hose, but Miele S4212 Vacuum cleaner will prove it wrong. Miele S4212 has a convenient six-position suction control that can be adjusted to between 200 and 1200 watts. I find the low power setting useful when I clean picture frames, curtains and so on. The highest power one picks up a lot of old dust that sticks to the home base. 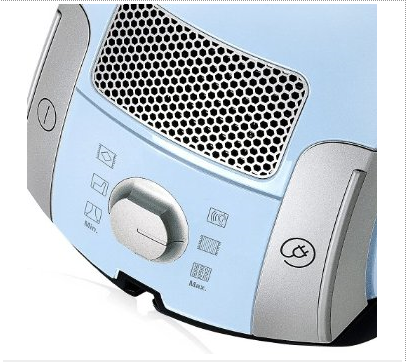 It provides optimal power usage with excellent cleaning perforamnce. You can find the suction control via a rotary dial on the canister. I do not know if it is true for other people, but for me, heavy and noisy vacuum decrease my motivation to clean the house! Once I walked home from a parking lot that is at least 300 feet away from my house, and I heard a vacuum noise. I was thinking about how noise it was while I was walking home, but when I got home, I realized it is my wift cleaning the house! I felt so sorry for my neighbors and was really embarassed. Miele S4212 will give you a totally new experience! It is super quiet and now I feel comfortable vacuuming my house on Sunday morning. Clean air was not our vacuum shopping criteria, but Miele S4212 reminds me how important this feature is. Based on our prior experience, we assumed that the air coming from the machine might be a litle bit dusty, so we normally wore masking when we cleaned the house. Miele S4212 is totally beyond our expectations. The combination of the Miele Hyclean Dust Bag, Super Air Clean Filter and Sealed System Construction (SSC) ensures that only quality clean air comes out of the machine, and we extremely appreciate these design. This system removes 99.9% of particles with a diameter of 0.3 microns or more. The Sealed System Construction (SSC) ensures that unfiltered air does not go back into the environmen. Miele Hyclean Dust Bag provides additional filtration. If you suffer from allergies or asthma, Miele S4212 has the right level of filtration for you. 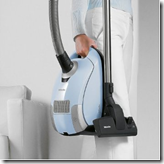 Vacuum cleaners are big investment for us and probably for you as well. No one wants to spend a fortune and purchase a cleaner that does not last. Miele S4212 is made in German and has a 20-Year Average Life-Span. The Polaris carries a 7-year warranty on the motor (which is totally beyond 5-year industry standard) and a 1-year parts and labor warranty on the remainder of the vacuum. Miele S4212 has 62 customer reviews on amazon and the average amazon rating is 4.4 out of 5. Those reviews stress the machine’s power, filtration, mobility, and so on. This little vacuum not only has fabulous suction, it has NEVER gotten clogged! We have to admit that not every thing is perfect, so does our Miele S4212. Based on my experience and consumer reviews, I have a list of pros and cons that may be helpful to you. To us, these cons are minor issues. The power cord is short, but it is about the same as vacuum cleaners I have used. In addition, our house has power outlet almost every corner, so it is not a problem for me to move it around. On top of this, Miele S4212 is very light and it is very easy to move it over. 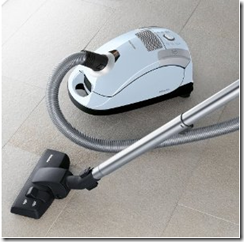 Where can you buy Miele S4212 Vacuum cleaner? 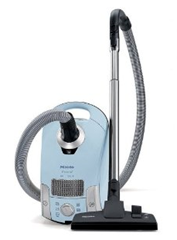 You can buy this Miele S4212 Vacuum cleanerfrom Amazon. At the moment they include free shipping and from what I can tell when comparing prices with other online merchants, Amazon do currently have the best deal especially with the free shipping option. Click here to view on Amazon.